JoCo Cruise Crazy 3 Guest Fortnight is upon you! That’s right, two weeks of guest comics by some of my best friends and favorite artists. Week one, being this week, being the week that I’m actually on a high seas mechanical roving self contained party island (or B.O.A.T) will consist of four comics that sort of by accident tell a story. Its weird how it all worked out. 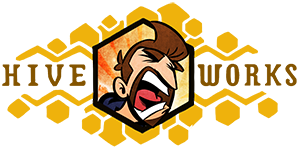 Week two will be a “theme week” consisting of three artists giving their perspective on the same… well, theme (a certain Fox TV shows certain misappropriation of a certain bearded troubadour’s certain cover of a certain song about butts). After that we’ll have TWO MORE GUEST COMICS not even about cruises at all just to ease you back into laughing at picture+word combinations that are not about boats, oceans, rum punch or constantly blasting reggae music. I’ve seen all of the comics and I highly endorse each and every one. This is not a “check out for two weeks, then come back when the J.J. Abrams comics return” situation. You are going to LOVE these comics. We start the Guest Fortnight with one of my favorite artists and convention cohorts, Angela Melick. Angela is an engineer and does a wonderfully hilarious auto-bio comic called Wasted Talent. Take a look at that comic up there and you can the engineer’s mind at work. SO MUCH DETAIL. There are gags upon gags. Plus WHERE CAN I GET THAT CATAPULT-CANNON FEZ?!?!? This is also the very first time in HEstory that my wife, Emily, has been portrayed in the comic. Since I’ll be writing all of these posts in the past, I can only assume what I’m doing right now (now being Monday, and the past being the previous Saturday). Hmm… we will have been on the water for a whole day by the time this post appears. Let’s assume Somali pirates have commandeered the buffet, but (joke’s on us) they’re FANTASTIC cooks. I’m probably not brushing my teeth with rum punch yet, but the week is still early. COMMENTERS: You can see above that we’re bringing ukuleles and custom fezzes on our trip. What are your non-standard essential travel items? 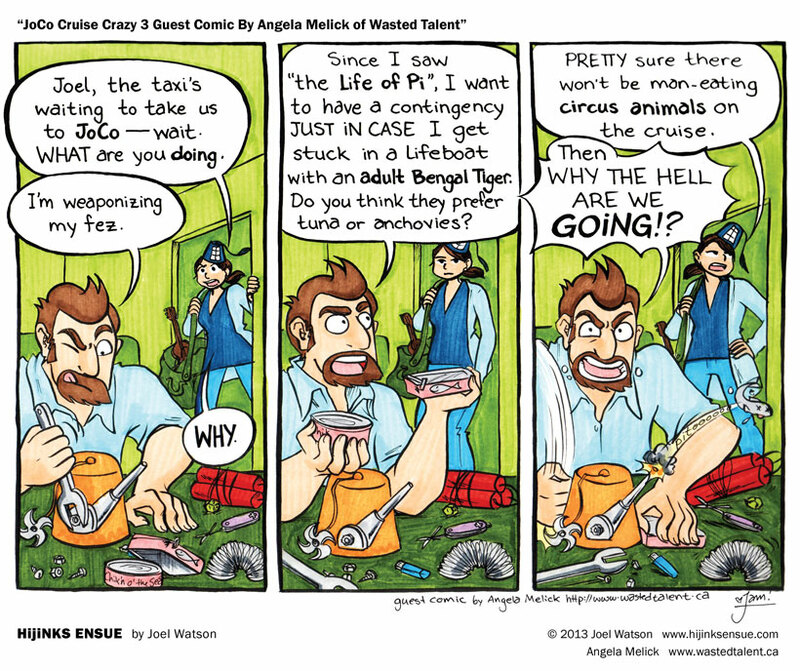 Posted in Uncategorized and tagged angela melick, hijinks ensue guest comic, JoCo Cruise Crazy, JoCo Cruise Crazy 3, Life Of Pi, movies, wasted talent. what period bowie knife? Ziggy bowie knife or dancing shoes bowie knife? God in heaven I wish I was going to the JoCo cruise. Angela hits another guest strip out of the park (I started reading Wasted Talent after her brilliant QC guest strip). Her demented Joel (tautology?) in the last panel is great! Non-standard essential travel items: A sewing kit complete with things to sew. I bore easily, frustrate easily and hate other people. Sewing fixes all of those things. So that's why they packed the horse masks. Wait, a ukelele is non-standard? The one with the hidden panel for the bacon vodka is. Is that a Calvin and Hobbes reference I spy in the middle panel?